An adventure exploring the whole of South Africa. Spectacular wildlife, cultural interactions with both the Swazi and Zulu tribes and the amazing scenery of the Drakensberg and Garden Route. The tribal lands of the Wild Coast offers an opportunity to witness traditional life in rural Africa. Enjoy a range of activities from Big 5 game walks, open vehicle game drives, beaches and local markets. Our adventure begins with an early morning departure from Johannesburg. We travel east to the “Low Veld”, and make our way to the lodge which is situated in Big 5 territory. The private reserve forms part of the Greater Kruger Park. Tonight we enjoy a traditional South African meal. After a light snack we head off on a morning game walk. Game walks provide an opportunity to stalk wildlife and enjoy the serenity of the African Bush. We return to the lodge for a welcome brunch and rest. Later in the day we do our first open vehicle game drive. The experienced guides will help spot wildlife. The game drive continues into the evening giving an opportunity to spot nocturnal animals. Today we explore the scenic Panorama Route. The Panorama Route offers spectacular views and we spend the day exploring. We visit Blyde River Canyon, God’s Window and Bourkes Potholes. Lunch is enjoyed in the rustic town of Graskop. We head onto Hazy View where we spend the night in log cabins located in an indigenous forest. A full day is spent on safari in the Kruger National Park. The Kruger Park is well known for its concentration of animals and we can expect to see a wide variety of wildlife. The vehicle offers an elevated view which makes for excellent viewing and photographic opportunities. Lunch will be enjoyed at one of the official Kruger Park rest camps. After a long day of exciting game spotting we head back to the lodge for well-deserved rest. Travelling south we cross over from South Africa to the “Kingdom of Swaziland”. Swaziland is a very traditional, tribal country and as we travel through the country we will encounter traditional villages and spend the evening learning about the local customs and traditions. Crossing back into South Africa, we journey across the rolling hills of Zululand. This is tribal land and the hills are dotted with villages or “kraals” as the locals say. The afternoon is spent on a safari game drive through the Zululand game reserves. These reserves offer sanctuary to a large population of both Black and White Rhino. Travelling inland, we pass the historic battlefields between the “Boers and the British”. We spend the next two nights in log cabins high up on the slopes of the mountain. The area is known for its incredible scenery and hiking and guests have plenty of time to explore the area. Leaving the mountains we descend to the welcoming Indian Ocean. Arriving at our lodge we spend the next couple of days soaking up the sun and beach. It is time to relax and kick back. There is a seaside village where one can browse and enjoy the local hospitality. The Wild Coast or the “Transkei” is the tribal homeland of the Xhosa people and is the area where Nelson Mandela grew up. Unspoiled beaches and estuaries makes for some of the best hiking in the country. This is one of the highlights of the tourand our lodge is situated on a secluded beach. Leaving the lush coastland of the Wild Coast we travel through the Karoo. The Karoo is a semi - arid area and we drive through scattered hills and ravines and make our way to Grahams Town, a well-known university town. After a long day in the vehicle we have time to explore this frontier town. 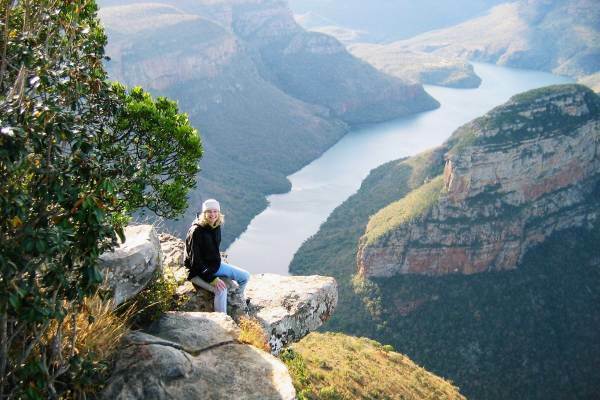 The Garden Route is one of South Africa’s premier tourist destinations and has plenty on offer. From indigenous forests, secluded beaches, rivers to a wide range of adventure activities. On route to our lodge we visit the Titsikama National Park, where we do a hike across the popular suspension bridge. We spend the first night in the Storms River area. There is loads of activities on offer, including kayaking, hiking, biking or a visit to a local township. The next day we spend slowly meandering up the Garden Route taking in many of the popular stops and views. We spend the evening in the popular town of Knysna where you can explore and enjoy the local restaurants. Today we leave the scenic Garden Route and head for Cape Town. We pass through Hermanus – known for its whale watching. We arrive in the “Mother City” – one of the world’s most beautiful cities. We explore the area including Cape Point, Wine farm, the Waterfront and other attractions. We do take the time to hike up Table Mountain and enjoy the views across the city. Our adventure ends on the morning of the eighteenth day.